One of the best classes for this approach is the Druid. Thanks to Spiritshift and the overall most balanced spell repertoire (a good mix of AoE damage, crowd control, support and healing spells) out of the vancian casters, the Druid is one of the most versatile classes in the game. A second premise of this build is to make the best out of the fact that the most equipment does nothing for druids while beeing spiritshifted. The only attribute from equipment that carries somehow over is INT, because it affects the duration of Spiritshift. The only item that directly pushes Spiritshift is the Wildstrike Belt. One one hand, this opens a lot of freedom for some unusual item combinations. On the other hand, it means that base attributes are very important for the offensive potential of the build. The solution is - as always - to dump RES. Dumping RES sounds like a bad idea on a frontliner, but we can easily solve the resulting concentration problem through items and the deflection loss opens the opportunity to make good use of Spell-Holding items. A character that punishes his foes for critting him through various Spell-Holding items. One of the best single target damage dealers in the game while beeing spiritshifted (thanks to heavy talent point investment and spells like Avenging Storm). One of the best crowd control repertoires in the game thanks to spells like Returning Storm, Relentless Storm, Avenging Storm, Calling the World's Maw, Embrace the Earth-Talon and Overwhelming Wave (and through Spell-Holding items like Swaddling Sheet). A decent passive healer thanks to items like Steadfast and Shod-In-Faith, with the option to make use of one of the many active healing spells of the class, when the situation requires it. Great defensive group buffs like Form of the Delemgan and Moonwell (and Holy Meditation thanks to Celebrant's Gloves). Emergency tools like Beetle Shell and 'oh-****-buttons' like Taste of the Hunt (for more information look at the Spell Guide section (2nd spell level) of this thread). Decent tools to engage combat thanks to spells like Tanglefoot and Overwhelming Wave. Another body that manages to survive in the frontline. Unmatched amounts of shock damage dealt! If you do want to play a Spiritshift Druid, but don't like to dump RES or don't want to put so many good items into a single character, this build could be better suited for your needs. If you on the other don't like spiritshifting at all, but somehow want to play a sturdy frontline caster tank, this build might be something for you. 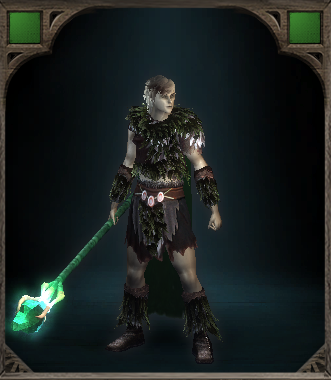 Pale Elf is a very strong (and often overlooked) option for a druid that mainly operates in the frontline. The reason is that Elemental Endurance complements Form of the Delemgan just perfectly, but we'll get to this later. Also elves are often associated with cat like attributes like agility, keen senses and good reflexes, so I knew that the Thundercat had to be an elf. This build is a melee/ caster hybrid and as such the value of DEX cannot be measured in gold, but we'll get into this later too. For lore reasons this happens to be a plausible heritage for a pale elf, because the Glamfellen (and I quote the official guidebook here) "appear to be among the most stationary ethnic groups in the known world" and seldomly venturing far north from The White that Wends, but at some point Sagani also mentions that it is not unusual for some glamfellen tribes to hibernate in Naasitaq (Deadfire Archipelago). We mainly choose Explorer for the Surival skill point, but I guess it is also a comprehensible background for a Pale Elf who turns his back on the polar regions of the world. It's not only the only valid choice to become a true 'Thundercat', but also one that you'll learn to appreciate (due to the inherend increased attack speed of the cat's claws) once you get your fingers on Avenging Storm. Like I said, this build is a caster/ melee hybrid and as such it is in dire need to get the obligatory caster job (preparational spells like Taglefoot followed by at the very least Returning Storm and later Relentless Storm; rest depending on the situation) done pretty fast. Otherwise the fight is over before we even have the chance to use Spiritshift. That's the main reason I value DEX so high. Also, let's not forget that DEX does alot for the physical damage output too. With MIG and INT beeing maxed out and with non-dumped CON, you have to decice whether you want to focus on DEX or PER. We focus on DEX here for reasons explained above. The most powerfull spells in our arsenal (Returning Storm, Relentless Storm and Avenging Storm) target the reflex save, which is both easy to debuff and relatively easy to land. After finishing our casting routine, we mostly hit disabled enemies anyway and we don't need a very high base accuracy for that. There are lots of options to boost Accuracy sky high, but there are very limited options to do the same for DEX. Also as AdreaColombo correctly stated here, the defensive stats of enemies in this game were never re-balanced after the changes to perception. So the game is balanced around 10 PER. You just have to stand your man long enough for your CC/ Storm spells to land and do their magic. Even with upscaled content the chances are pretty high that you somehow outlevel most of the content. With all Prayer Against X spells now granting immunity rather than resistance, it is no longer needed to push so hard for good will (and fortitude) ratings at the cost of other things. It is not the end of the world if you get hit by an affliction now and then. We don't intend to tank dragons. Effigy's Resentment: Devil of Caroc (+1 DEX) is pretty good, because it gives universal +1 DR bypass too. Galawain's Boon is more of a role-playing choice here, but it's one of the decent ones for this build too. If you want even more DEX, take Skaen's Boon instead that also comes with +1 Survival. Wael's Boon is also pretty decent. We only have room for one elemental talent and the most powerful Druid spells are based on shock damage, so I'd highly recommend to use Wildstrike Shock, Greater Wildstrike Shock and Heart of the Storm to get the most out of the class. Wildstrike Shock and Greater Wildstrike Shock add up to a whopping 45% damage multiplier, so these talents work like a big lash, which means that the more damage you do with your claws, the more damage you get out of the lash. Because of the natural high base damage of the claws coupled with the huge damage multiplier of the Wildstrike lash, the druid totally adores ANY kind of damage bonuses. That's the reason why we take Savage Attack and Apprentice's Sneak Attack. Vunerable Attack is not really necessary with high base damage weapons. Against some enemies you might deal a bit more damage with it, but against others it takes away as much as it gives or even worse. With Outlander's Frenzy now beeing usable once per encounter, it has become a popular and thematically fitting choice for the Spiritshift Druid. Just be sure to use this BEFORE Spiritshift. Tanglefoot helps us to land our most powerful storm spells: Returning Storm, Relentless Storm and Avenging Storm. It is also a fantastic combat engagement tool. Autum's Decay might be the more popular choice, but I really learned to love Taste of the Hunt recently. You may take a look into the Spell Guide section of this thread, if you're interested in finding out more about this topic. I want to say at least that much: Think of it as a Second Wind like ability when beeing spiritshifted. As long as you have some 2nd level spells left and are spiritshifted, you can outheal everything that does not one-hit you. Returning Storm is a no-brainer for our Thundercat. I highly recommend to put at the very least 13 points into Survival, which is not that hard to achieve as a druid with the Explorer background. This lets you choose between Damage Reduction III and Movement III. For the latter you have to equip an item that gives +2 Survival like the Rugged Wilderness Hat. You can savely switch everything back to normal after the rest, without loosing the resting buff. You save a lot of skill points this way... wicked! Move Speed is a really potent stat on a Spiritshift Druid, because we want to reach our targets as fast as possible, to get the most out of Spiritshift before its duration expires. Movement III gives us whopping +3 Move Speed and even works while beeing shapeshifted. The rest is really up to you. 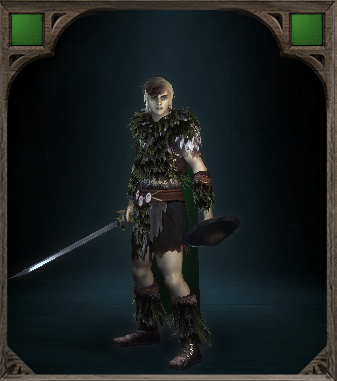 I favor Athletics over Lore, because I don't want to waste my time on using scrolls with this build. Also Athletics' Second Wind ability is always a good idea on frontliners. This build makes excessive use of Spell-Holding items and since we start every fight with casting some preparational spells, we have a certain time window for all the Spell-Holding items to proc. You just have to make sure that these things procs BEFORE you use Spiritshift. With maxed INT and MIG and dumped RES this build makes for a good candidate for the Shod-In-Faith boots. If you have a second frontliner that could make good use of these boots, better use Echoing Misery on this druid instead, because the Consecrated Ground effect of Shod-In-Faith ends the moment you use Spiritshift. Tempered Helm and all the Spell-Holding items have some kind of weird synergy, because the -5 Deflection penalty from the on kill proc of the Helm turns out to be rather beneficial. Remember that we WANT to get hit by a Critical Hit BEFORE we use Spiritshift. I cannot think of any class build that could make better use of Black Sanctuary (maybe some kind of Rogue build). One or even two passive Warding Seal procs per encounter are a very nice and damaging addition to our already great shock damage repertoire. Swaddling Sheet - the newest and most likely the best Spell-Holding item in the whole game. It comes with a huge damage and defensive (CC) potential, its version of Overwhelming Wave is foe-only, and with proper positioning it is a real gamechanger you never want to miss again. Steadfast on a Druid? Are you crazy? Most certainly yes, but this Druid build makes good use of it, I ensure you. +1 RES and +5 Will (resulting in +7 Will) makes up for half of the penalty we get from dumping RES. Immunity to Frightened and Terrified, both very annoying debuffs for any frontliner, are just amazing. But the real potential of this soulbound weapon lies in the 20% chance to cast Restore Major Endurance on beeing hit by a Critical Hit, which also heals party members in a decent radius around you. Together with Shod-In-Faith this turns you into a walking healbot. Oh yes, lets not forget the Celebran's Gloves! Now this item is very crucial to this build and I highly recommend to get this via save scumming as soon as a Major Adventure pops up. 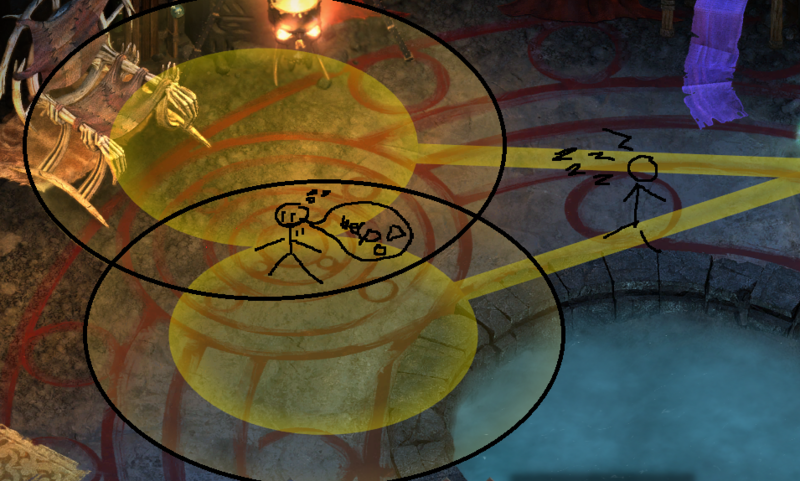 When Holy Meditation procs, it makes up for our bad concentration rating and our mediocre will defense, and also gives us +10% Ability Area of Effect, which is a nice little extra bonus. Needless to say that the whole party benefits from it. With this equipment template we achieve some pretty good defenses against afflictions too: Thanks to Steadfast we are immune to Frightened and Terrified. Thanks to the underrated Tempered Helm we get +25 Defense against Hobbled, Stuck, Paralyzed, Charmed and Confused attacks and +10 Defense against Dominated attacks. Thanks to Blaidh Golan we get -50% Stun and -50% Knock Down duration and +20 Defense while Stunned or Prone. At level 16 this build achieves the following unbuffed defenses with this equipment template: 75 Deflection, 90 Fortitude, 102 Reflex and 91 Will. And that without spending a single point into a defensive talent. That's not bad at all. With all these Spell-Holding items, the party position of this character should be right here. Steadfast and Black Sanctuary both come rather later in the game. Until then, basic Hatchets and Small Shields are your weapon set of choice. Tanglefoot [8.5/10]: Okay, lets start with a spell that is quite essential for us. It periodically applies/ reapplies the Hobbled (-2 DEX, -20(24) Reflex and -1.5 Movement) affliction to all targets caught in the enormous AoE (for a long duration). It isn't foe-only, but the huge radius and the spell template make it very forgiving to use. It is also one of the best engagement tools in the game. Just throw it between your party and the enemy group before the fight starts. This way you buy your team some time for clever positioning and proper preparation. Also, as mentioned before, the most powerful spells in our arsenal target reflex, making this spell not only a perfect combat opener but also a very good combo enabler. Sunbeam [8/10]: Just like the Wizard's Chill Fog, this is a very nice spell to apply the Blind debuff (for 15 base seconds!) while doing decent amounts of damage. The fact that it does its work instant (or fail to do so) and targets reflex, makes it both easier to land and more forgiving to use than Chill Fog, but I would not want to nominate a clear winner here. Furthermore, thanks to its damage type, Sunbeam is a great spell to make your life a lot easier against shades and phantoms in the first half of the game. Nature's Mark [7.5/10]: While a debuff of -10 Deflection and -10 Reflexes (both getting surpressed by the respective afflictions) may not sound like much, it is typically a good way to start a fight. This spell comes with a fast casting speed, a huge foe-only AOE and a long duration. Nothing really speaks against using that spell at the start of a fight... nothing but Aspirant's Mark! Why would you bother wasting your time casting this spell, when a party member can do it for you in every each and single battle. Better save your mastery slot for Tanglefoot! Charm Beast [6.5/10]: Yes it's a situational spell, but when facing groups of beasts it utterly trivializes those encounters. The most common beast families are: Beetles, Bears, Boars, Dragons, Drakes, Spiders, Stelgaers, Wolfs and Wurms. Especially useful in the first third of the game. Talon's Reach [5.5/10]: It deals an okayish amount of slash damage. What makes it situational good is its foe-only template and its fast casting speed. I tend to spamm it against foes that somehow slipped through the frontline and attack my squishy ranged companions. It also helps bursting down potential dangerous enemies. Winter Wind [4/10]: This is a pretty solid spell that comes with a foe-only cone template, which is rare. Probably my freeze damage nuke of choice against foes vulnerable to this damage type. As I most recently found out, the Push effect of this spell also tends to completly immobilize all kinds of Blights. Vile Thorns [4/10]: Like Winter Wind this spell deals okayish amounts of damage for a 1st level spell, but pierce damage isn't exactly the most useful damage type ever, the cone isn't foe-only (but you can handle that as a frontliner) and the casting speed is just average, but the Sickened debuff makes somehow up for that. Nature's Vigor [3/10]: It may not be bad per se, but if you use the Shod-in-Faith boots, the healing over time effect gets surppressed, which turns this into nothing more than a +15% endurance buff. If you find yourself getting bursted down in certain encounters, it may be of worth to cast this at the beginning of the fight to rise your maximum endurance a bit. Dancing Bolts [2/10]: Even with Hearth of the Storm this thing hits like a wet noodle. The only plus is the huge area of effect and the foe-only template. Hold Beast [7/10]: This spell is just incredible good against beasts. Fast casting speed, decent radius and mass paralization: what's not to like? [hot!] Taste of the Hunt [6.5/10]: This one is important: I tested this spell a lot in my last playthrough and came to the conclusion that it's better than its reputation. First of all, it's a Primary Attack with your currently equipped weapon, which means that you better use this spell while spiritshifted. Secondly and more important, it seems to take the damage of Wildstrike, Greater Wildstrike and the fire damage portion of the Wild Strike Belt into account, which is a very good thing. On the other hand, the problem I see here is that the heal component of this spell is directly linked to the damage you deal, which means that it is affected by both the DR and Deflection of the foe and your own ACC of course, and that is rarely ever a good mechanic for a healing spell. But then again, you can take adventage of this by attacking proned, stunned or even petrified enemies, which most of the time leads to a crit and a huge heal, and let's face it, stunning foes is very easy for us. I once landed a crit against a petrified target and wooooooooow, that was nice. Another thing worth mentioning is that the description sounds like the raw DoT gets converted into healing too, but that is not the case. Anyways, I think the potential is there (just remember that a Spiritshift Druid can hit pretty hard) and it scales extremely good. If your Druid stands close enough to a disabled foe target, this spell provides WAY more burst healing than Second Wind. Test it yourself. Autum's Decay [6/10]: A good example why the whole class is balanced around fighting in the frontline. Autum's Decay is one of the many cone spells in our arsenal and it's certainly one of the best, as it deals a considerable amount of corrode damage over time, which is one of the least resisted damage types in the game. This is one of the very few spells that I even cast while beeing spiritshifted. If you're in a good position to hit a chunk of enemies with this spell without harming your frontline, this is always a worthwhile investment in both time and resources. Insect Swarm [5/10]: The damage it deals is actually compareable to that of the DoT portion of Autum's Decay, but the damage type is a bit worse and the AoE is smaller. On the other side, it's foe-only which makes it much easier to use than the latter. The main use of this spell is the -10 concentration debuff, which is a nice support for the interupters of your party. One of my favourite spells against Ogre Druids and Delemgans in the first half of the game. Burst of Summerflame [4/10]: A decent nuke against fire vulnerable foes. Nothing more, nothing less. Woodskin [3.5/10]: An useful but situational buff with fast casting speed. Blizzard [2/10]: Blizzard hits like a wet noodle and the attack speed debuff is barely noticeable. Firebrand [1/10]: This is by no means a bad spell. The reason why I rate it so low here is that the Druid in general isn't a very good wielder for it and is usually better off using Spiritshift to deal melee damage. Returning Storm [9/10]: This spell is a BEAST that overshadows every single other spell on this spell level. It comes with a humongous radius centered around the caster, a veeeeeery long duration (30 base seconds) and procs countless times during that period of time, with each storm bolt dealing a decent amount of shock damage to a random single target and stunning it for a base of 3 seconds. Fire and forget spells like this are the dream of every Spiritshifter. And the long casting time is one of the reason why we push so hard for DEX. Keep in mind that the less enemies you fight, the more likely you hit the target you want. 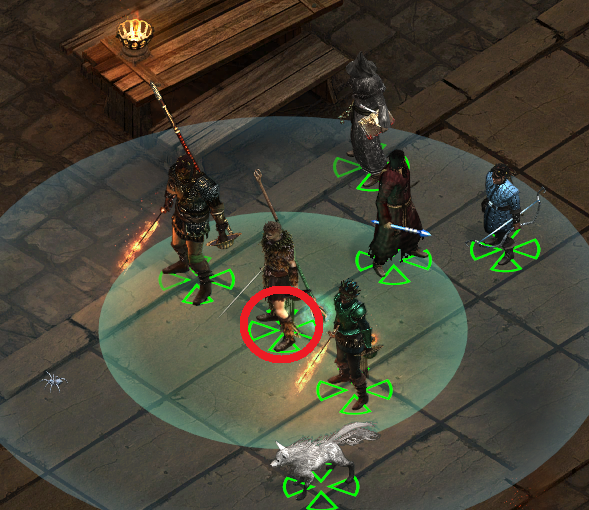 It is even possible to stunlock a single enemy with this spell, if it's the only target in the area of effect. Spreading Plague [6/10]: Weakened is a very potent status effect, that will make it easier to land spells that target fortitude or will defenses. This plague applies both Weakened and Hobbled to a primary target and then spreads the debuffs to 5 other enemies. The duration is good and it's one of the few spells that apply the former relatively early. Beetle Shell [4.5/10]: A life saver and panic button. This holds especially true for the first half of the game, where the 100-pt Stasis Shield buys your party the time to heal the target in need. In the second half of the game the absorb shield gets demolished pretty fast. All in all, it definitely has its times. Purge of Toxins [4/10]: There are some foes that use some nasty poisons and diseases against your team (like Crystal Eaters), and while some of them 'only' deal a certain amount of damages, other even inflict annoying disables. This spell is golden in these situations. Twin Stone [3.5/10]: This spell comes with an unique template. Every foe that crosses the path of the two boulders get hit by a mediocre portion of crush damage. Those enemies who stand inside the radius of one of the two explosions take a decent amount of pierce damage. Those unlucky fools who stand inside the area where the two circles intersect take the damage of both explosions, which can be pretty hefty. The problem is that the travel time of the two boulders is fixed, which makes the spell kinda hard to use from the frontline. Here is a sceenshot that visualizes what I mean. Infestation of Maggots [3/10]: [It worked some time before, but as of 3.02 this spell appears to be bugged. I tested it against all kind of Ogres and other stuff and it's ticks seem to deal 0-2 damage, depending on the percentage of health lost but regardless of the health pool.] This nasty little spell will deal 10 damage by percentage of health lost over time, which sounds complicated, but it just means that both the more wounded your enemies are and the bigger their endurance pool is the more damage they take. Decent against enemies like Ogres, Trolls, Fampyrs, Darguls, Adra Beetles, Snow- and Elder Bears, Drakes, Dragons, Flesh Constructs, and so on. Definitely a valid option in these scenarios once Returning Storm becomes per encounter. Stag's Horn [2/10]: Mediocre single target spell with a baked-in single target Nature's Mark. I wouldn't even bother to use this before Returning Storm becomes once per encounter and even then we have better things to do with our time. Nature's Balm [1.5/10]: I don't see how this is better than its predecessor Nature's Vigor. Don't waste your 3rd level spells on this one. [hot!] Form of the Delemgan [9.5/10]: Surprisingly, I haven't read a lot about this little gem in these forums. A fast casting buff that gives +8 Crush, Slash, Pierce, Corrode and Shock DR (do you see how Elemental Endurance complements this just beautifully? ), +1 Movement Speed, +25 Defense while Disengaging and Immunity to Stuck in a decent area of effect for a decent duration (base 20 seconds): THIS THING IS CRAZY! And it stacks with armor DR, bonuses from equipment, Armor of Faith, Second Skin and the survival resting bonus. The reason for this is that it buffs all the damage reduction types individually, while spells like Armor of Faith buff the DR in general. As Elric Galad pointed out in this thread, Binding Web and Form of the Delemgan makes for for a damn good combo, because the latter protects your whole squad from getting stuck in place. Calling the World's Maw [8/10]: An improved version of the Wizard's 1st level spell Slicken that also has a decent pierce damage component and inflicts Prone for twice as long duration. Of course it is a 4th level spell, we cannot spam it quite as much as the Wizard and it targets fortitude, which makes me a sad panda. But I gues we can't have everything. Anyways, you'll find yourself using it a lot. Moonwell [7/10]: Great heal over time, solid deflection buff, decent area of effect, not centered around the caster and a good duration: sound like a damn good - if not the best - healing spell? Yes it seems that way, but the scroll version is even better. Overwhelming Wave [7/10]: God this spell brings so much fun if you engage combat with it. The stun buys you the time to do some nasty things, that's for sure. And it deals some good crush damage too. Unfortunately, I fell so much in love with the new Form of the Delemgan that I find myself using this spell a lot less often than I used to do before 3.0. Keep in mind that it can be difficult to apply mid-fight because of its template. Wicked Briars [5/10]: The briars deal a decent enough amount of AoE pierce damage over a quite long period of time and also apply the Hobbled debuff, which is a nice bonus. But the real power of this spell lies in the considerable interrupting potential. The briars apply their interrupting time each time they strike, turning this into a great spell for high PER builds in combination with Interrupting Blows. Definitely not the business of this build, but I wanted to mention it nevertheless. Boiling Spray [3.5/10]: Not bad at all, but why would you ever prioritize this over Overwhelming Wave or Calling the World's Maw? As I most recently found out, the Push effect of this spell also tends to completly immobilize all kinds of Blights; even your own ones, so be careful! Hail Storm [3.5/10]: Just a basic, generic AoE nuke with a large radius... nothing fancy. At least the damage type is okay, but again, why would you ever prioritize this over Overwhelming Wave or Calling the World's Maw? Relentless Storm [10/10]: An improved version of Returning Storm that affects every single foe in the huge area of effect with every tick, in exchange for roughly the half AoE duration, less shock damage per tick and a shorter stun duration. Imo a fair trade... With proper preperational spells like Tanglefoot (to debuff the reflex saves) and some accuracy buffs, this spell alone is perfectly capable of disabling the whole battlefield for the full duration. A fire and forget skill that is probably the overall strongest CC spell in the game. Plague of Insects [9/10]: This spell deals tremendous amounts of raw DoT with a huge foe-only AoE over a very long period of time (base of 30 seconds). In fact, with high MIG this spell deals like 1/3 of the endurance pool of even the strongest enemies, making it one of the best AoE damage spells in the game. But if that was not enough, this also happens to be a great interrupting tool, while also debuffing all enemies in the radius with both the Sickened status effect and a -20 penalty to concentration. The interrupters of your squad will adore you for this. Embrace the Earth-Talon [8.5/10]: So this is basically the clone of the Wizard's 6th level spell Gaze of the Adragan, which petrifies (best disabling effect in the game) the foe targets in the area of effect for a base duration of 6 seconds, with the only difference that the Druid's version even comes with a solid AoE slash damage component, with twice the range and much earlier. But dear god, why does this spell has to be on the same spell level like Relentless Storm? Fire Bug [6.5/10]: This spell deals decent fire damage against a single target and then jumps 8 times between foes that stand in a 5m range of the initial target. The real power of this spell lies in the high burst potential against 2-3 enemies standing close together (when there are no other enemies in a 5m range of them), as the spell bounces between the few targets resulting in huge chunks of fire damage against those unlucky fools. Nature's Terror [5.5/10]: It is more of an emergeny button than a damage spell, that comes in handy when you are swarmed and need to lower the Accuracy of the foes ASAP through terrifying them. But be careful the spell's template make it possible to hit your friends too. Wall of Thorns [4/10]: Solid wall spell with a strong interrupting potential. The Weakened debuff is also quite nice. But all in all, it can't stand a chance against some of the other spells of this spell level. Cleansing Wind [3/10]: Basically an improved (but a little bit slower) version of the Priest's Iconic Projection spell with twice the healing potential, but it comes much later and without any kind of damage component. A solid healing spell that competes with some of the most powerful spells in the game on the same spell level. Don't waste your precious 5th level spells on this one. Venom Bloom [8/10]: This is usually our bread and butter 6th level damaging spell of choice, and in general a good one too, as it (for a base of 15 seconds) periodically deals good raw damage in a decent AoE and is foe-only. It deals even more raw damage per tick than Plague of Insects, but its duration is only half as long and its radius is half as big. Furthermore, it constantly applies/ renews the Weakened and Frightened debuff to all foes in the AoE, both very potent debuffs. Definitely the most useful spell on this spell level, at least for the Thundercat. Garden of Life [4.5/10]: A very situational healing spell, but one that comes with a huge burst healing potential. It heals for a base of 20 endurance (~25 Endurance with decent INT) for every corpse in a very huge AoE, which means that it needs at least 3 corpses to heal more than the Priest's Restore Critical Endurance, but in general you shouldn't use it if there aren't at least 5-6 (unused ) corpses around, which results in roughly 125-150 endurance to everyone in the huge AoE. That's fine, isn't it? Sunlance [4/10]: A single target nuke that deals huge amounts of pierce damage coupled with a 50% burn damage lash, but the casting speed is just average. As a Thundercat only ever use this spell if you really need to burst something down that you can't otherwise reach fast enough. Even a single hit with your claws tends to deal more single target damage than this spell. Also, completely avoid it on low DEX builds. Rot Skull [3.5/10]: Don't get me wrong: this is a very good spell. For a ranged Druid build I'd rate it more like [9/10]. Spiritshift builds tend to ignore it completely, thus the low rating. It summons a universal wand (works with all Weapon Focus talents, Marksman, etc.) that deals good crush damage per hit to a single target and applies a huge corrode DoT in a small AoE, both very good damage types. The DoT stacks with itself, resulting in more and more damage numbers showing up over the enemies heads. Would be even better on a Blast Wizard. Nature's Bounty [5/10]: First of all, if you use this spell every empty quick slots in the party are filled with one bottle of nectar. Drinking the juice results in +20% Attack Speed, +5 MIG, +5 PER and a negligable amount of endurance healed. Yes you read it right! For this buffing spell to even work, you need to make sure that every single party member has at least one empty quick slot. And then you need to manually use it on every each and single member of your party to activate the buff. Sounds like a lot of fun... NOT! Ah, I forgot... drinking this stuff also triggers the usual drinking animation. Very annoying! Furthermore, and this is the imporatant part, the usefulness of this spell is highly dependant on your party composition and ability/ talent destribution. It does not stack with the PER buff of Crowns for the Faithful and neither with the MIG buff of Devotions for the Faithful, both frequently used buffs in partys that bring a priest along. Also, the attack speed buff doesn't stack with other active attack speed buffs (like Outlander's Frenzy, Deleterious Alacrity of Motion, etc.). All in all, this spell has some serious flaws, but at least it tends to be useful if there is no priest around. Weather the Storm [3/10]: A short (10 case seconds) lasting party buff (+15 Burn, Freeze, Shock and Corrode DR) with a decent AoE and an average casting speed. Lost lots of its value due to the implementation of Form of the Delemgan and just doesn't last long enough to be a meaningful addition. Against strong casters (for example those of the Magran's Faithful bounty) it can be sort of okayish if you time it right. My advice: better don't waste your time on using this spell. Avenging Storm [10/10]: A long lasting (20 base seconds) self buff that turns the Thundercat into the best single target damage dealer in the game, at least while spiritshifted. It adds a decent amount of shock damage to every melee attack (it does not work like another shock lash, it's more like a spell strike that procs on every successful attack) and also stuns for a base of 0.8 seconds (~1,1 to 1,2 seconds with good INT). This means that you'll most likely stun-lock your target! Cool, heh? Furthermore, every foe character hitting the druid take the same amount of shock damage and get stunned for the same duration, so it works like a Flame Shield on steroids too. Fire Stag [7.5/10]: Finally, a good summon with somewhat decent stats: 86 ACC, 66 DEFL, 80 REFL, 88 FORT, 56 WILL and 276 Endurance (1653 Health). Needless to say that these stats can be further buffed by spells like Devotion for the Faithful. But the stats are not really the main selling point here anyway. What makes this spell good is the fact that the stag leaves behind Walls of Flame everytime it moves. You can use that to your advantage by moving the Fire Stag manually back and forth (or running circles), resulting in fire being everywhere, causing unmatched amounts of interrupts. If you happen to have Wizard in the party, you can even cast Pull of Eora to pull enemies directly into the fire, and then cast Binding Web to keep them stuck in place. You can follow this by casting Embrace the Earth-Talon with you druid or Gaze of the Adragan with you Wizard to petrify the enemies, which greatly amplifies the damage of all the flame walls. Once Combusting Wounds are fixed (hopefully in the next patch), it will be a great addition to this huge combo. But be warned, if the stag dies all flames are gone, but there are ways to prevent that. When your stag is about to die, just use use spells like Withdraw or Beetle Shell to rescue it. The former makes it even immune to everything, but don't be afraid, the flame walls will continue to work. But of course you'll need a Priest for that. Now you might think that's all, but the Fire Stag also comes with Torrent of Flame (once per encounter), a decent burn AoE damage finisher that also kills the stag in the process. So use this ability if the enemies are very low on endurance, your stag is hopefully lost or the duration is about to expire! Furthermore, it can use Stag Carnage (works like the ability from the ranger pet) once per encounter and it is naturally "protected" by a Flame Shield, that deals small amounts of burn damage to every foe that dares to strike it. All in all, if used right, and I don't deny that the combo is very costly, this is by far the best summoned creature in the game! Edited by L4wlight, 22 April 2016 - 08:36 PM. I still have to read it all - but I already have a suggestion. You HAVE to use spears when in kith form. Because... you know... Britney! Really nice - and really a different kid of shapeshifter build. I love that synergy between Form of the Delemgan and Elemental Endurance. I totally overlooked that. Did you consider to put on Sanguine Plate to proc "the real" Frenzy and then switch to cat form? Should spare you a talent (Outlander's Frenzy) and give you a bit better stat and speed boosts. With the fitting helm you will also have that anti-prone and anti-stun thing like with Blaidh Golan. Would slow you down in kith form of course... What do you think? What about Gyrd Háewanes Sténes? I can restore one Spiritshift use per encounter. You have to attack with it though. As for the Sanguine Plate, yes I think it is worth to consider (and I'm glad you brought it up and I'd like to hear your opinion about it too) and I have to admit that I totally forgot about the new Sanguine Plate's Helm, but there are two things about it, that I don't like: 1) the look on a druid (okay this is rather subjective) 2) the casting speed in plate armor. The latter is not even that bad, because (I only tested it shortly once) most of the time you get hit by a critical hit very fast, so you profit from the frenzy proc for the obligatory pre-cast phase too. But then there are times when you cast some more preparational stuff, leaving you with very little frenzy uptime for the spiritshift phase. With Outlander's Frenzy you have more control over the whole thing and you can use it right before spiritshifting and jump into the frey right after. In the end, it could be a matter of play style, taste and party composition. I really have to test it some more. Maybe I'll add an alternative equipment entry, if I'm pleased with the results. As for the soulbound sceptre: I tend to use this on my support priest or on my wizard, but yes it can of course be a thing, especially if you have a party that is not that strong in the AoE damage department, which extends the combat duration a bit. In my last playthrough the fights were rarely ever long enough and the duration of Spiritshift with 22 INT is most of the time sufficient. Also getting the sceptre to proc is not exactly a reliable thing. Edited by L4wlight, 18 April 2016 - 02:42 AM. Hahah... have overlooked that one. Yes - I tried it when I was toying around with a Firebrand druid. It's good if you deal a lot of damage per hit. Or if you are a barb with Dragon's Maw. The synergy of petrify + Taste of the Hunt is a really good point. Missed that, too. A Firebrand druid... I'm a bit sceptical here. How did that turned out for you? EDIT: As for Taste of the Hunt. What makes the heal go through roof is that it takes Wildstrike into consideration. You should test it with Spiritshift. Firebrand can't compete with that. Edited by L4wlight, 18 April 2016 - 03:11 AM. Yeah. A Firebrand druid is kinda crap. I just thought the high damage per hit and Taste of the Hunt would be a good combo - but the druid lacks melee ACC and damage modifiers to be good at it. I mean besides spiritshift. Binding web and form of the delemgan can be a sick combo by the way (immunity to stuck) especially considering bonus to kiting from form of the Delemgan. Nice find. I'll add it later to the spell guide. Binding Web + Immunity to stuck is a great combination. I can tell because I used a monk with Stag Helmet to drag an Ectophsychic Echo beam through an area of Pull of Eora + Binding Web - using Flagellant's Path. And since you are a druid - und if you have a wizard in your team: try the combination of Fire Stag + Pull of Eora + Binding Web + Embrace the Earth Talon. Edited by Boeroer, 18 April 2016 - 04:25 AM. Yeah the Fire Stag + Pull of Eora combo is a pretty nasty combo, I tested it too. Especially if you move the Stag manually back and forth, resulting in firewalls beeing everywhere, causing unmatched amounts of interrups. But without petrifying the foes it deals negligible damage. So all in all this is a very spell cost heavy combo that has it's times. Most of the time I prefer Avenging Storm over Fire Stag, at least with this build. Edited by L4wlight, 18 April 2016 - 05:20 AM. This is comprehensive and awesome. I really, really appreciate the spell guide. Thank you. Maybe I find some time to finish the last three spell levels of the spell guide on friday. I my opinion, if your party include a wizard you should suggest not taking Tanglefoot as Spell mastery. With Delemgan form active, Binding Web basically becomes Foe-only which is the only Tanglefoot only defect. And Sunbeam is such an excellent alternate choice ! I noticed about form of the Delemgan last week. I think it wasn't noticed initially because the only online description (WMII Data miner topic) is about its 3.0 version which was "only" 5 DR buff, and because its description is a mix of too many things to be quickly understood. Furthermore, druids have so many good 4th level spells that people probably were not too eager to find alternate choice when Form of the Delemgan was released. If Form of the Delemgan has been a 7th level spell, more people would have been aware of it (sad but true). I would rank it the 3rd best party buff of the game after Crown and Devotion of the Faithful. Edited by Elric Galad, 18 April 2016 - 10:32 AM. I have not used it for a long time, but now that I've tested some stuff lately, I found out that Infestation of Maggots appears to be bugged. The damage ranges from 0-3 and I tested it against different monster types. It used to be pretty nasty against some kind of monster groups like Ogres. This is now reflected in the Spell Guide, as well as the suggested Form of Delemgan and Binding Web combo. Edit: Oh, I missed that it's now even officially confirmed that Infestation of Maggots is bugged. Edited by L4wlight, 19 April 2016 - 07:32 PM. This is really, really good. I'm not gonna use it just yet, as my current playthrough is more story based, but I'm stealing ideas from this for my character. Has anyone tested the Cat Spiritshift form as far as attack speed? The description says it has a naturally faster attack as well as the 1 per rest 33% bonus, however in game the claws state that it is average attack speed like all the other forms. The casting animation for the speed buff is also an average time as well, I believe, which may cost you nearly as much time as it takes away from your attack recovery over ~20 sec max(thought the multiplicative stack with a DAM would definitely be worth it). Yes I tested it some time ago and retested it just to be sure. I created two druids with the same INT and same DEX (I used 4 DEX and 18 INT), one with Boar Form one with Cat Form. Then I cheated with the console (iroll20s --> nodam), engaged the wolf pack in the north of the caravan with Calisca (so that the wolves interrupt her not me), switched to slow mode, placed the druid right in front of one of the wolves, switched to the respective form and counted the times of hits/misses/etc. during the Spiritshift duration (and checked that there where no interrupts). Result: 9 (nearly 10) hits in Boar Form and 14 hits in Cat Form. I did two test runs for both forms. Cat Form attacks much faster and it's especially nice the moment you get Avenging Storm. If I learned something in this game, it's that you should not take the descriptions too seriously. Edit: And the per rest ability of the cat form is not that great, I agree. But that's not the main point of the form. Edited by L4wlight, 19 April 2016 - 09:21 PM. Cool, thanks for letting me know. That seems to just about match 44 frames(fast dw) vs 66(average dw). I agree the descriptions are often hit or miss and the two description on the attack speed contradict each other so it is nice to know which is which. I guess with DR being almost negligible at this high of damage the attack speed is worth more than the boars wounding ability.